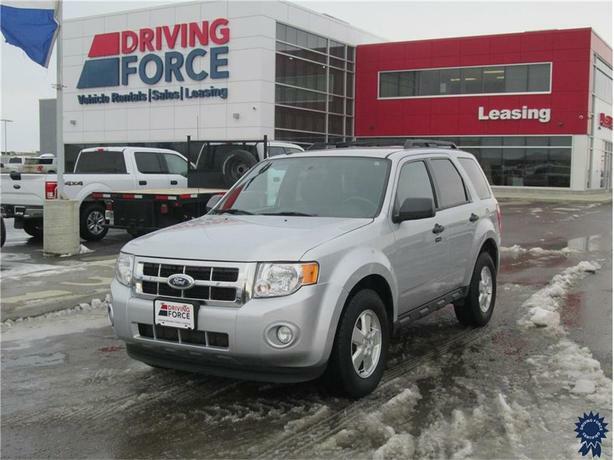 This 2012 Ford Escape XLT 5 Passenger 4X4 SUV comes with a 6-speed automatic transmission with over-drive, premium leather seats, Canadian Winter Package, engine block heater, easy fuel caples fuel filler, 16-inch aluminum wheels, front fog lamps, black roof rack rails, AM/FM stereo with CD/MP3 player, tilt steering column, power windows, power door locks, remote keyless entry, day/night rear-view mirror, air-conditioning, tire pressure monitoring system, 62.5-litre fuel tank, and tilt steering column. The 2.5-litre gas engine provides 171 horsepower at 6,000 RPM and 171 lb-ft of torque at 4,500 RPM. Touch base with us to discuss purchasing or financing options that are right for you and experience the difference you will only find at DRIVING FORCE Vehicle Rentals, Sales and Leasing.